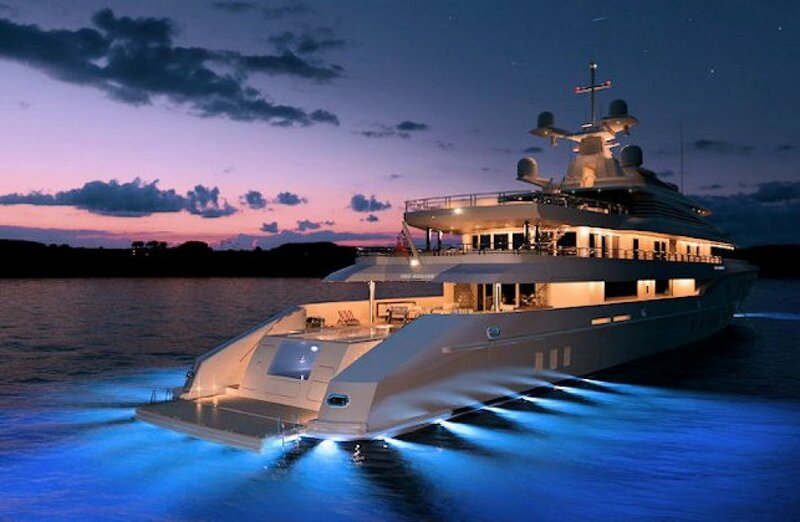 Mega Yacht AXIOMA (formerly RED SQUARE). Six decks across 72m create enormous volume (over 3,000 sq m) that allows for the luxury of magnificently large guest areas. Launched by the shipyard Dunya Yacht in 2013, AXIOMA features a beach house-style interior by the designer Alberto Pinto that contrasts natural woods and luxurious flourishes, and exterior design by Sterling Scott Yacht. An unusual feature is the double-height main saloon, while on the main deck the infinity swimming pool is the outstanding exterior feature. The sun deck has lounging and intimate seating areas forward, while aft is more alfresco dining, a large spa pool surrounded by sun pads and a bar. 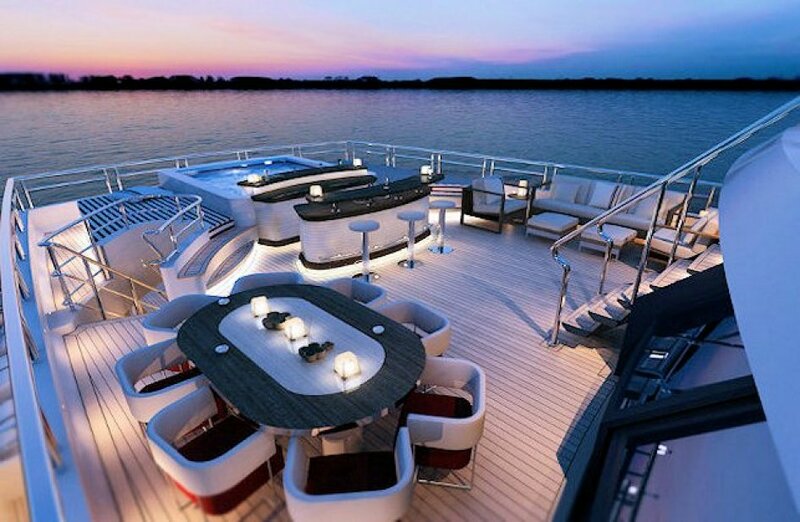 The yacht also boasts a cinema, gym, spa and of course a heli-pad. A bridge deck that has a heli-pad and a third saloon with a glazed roof creating a conservatory. An upper deck with the forward section dedicated entirely to the owner while aft, is a cinema/lounge that leads out to a dining terrace. Outside, on the main deck, is the beach club with an infinity swimming pool and four sets of double size sofas. The upper and main decks have one of AXIOMA’s most spectacular features: an open gallery mezzanine. Forward on the main deck is a full-beam VIP, two equal doubles and two twin cabins. A large health and beauty spa and a gymnasium are just part of the lower deck space. With the tenders removed, two, 15 metre teak balconies fold down over the sea, nearly, doubling the size of the available space. The interior is typical of Alberto Pinto’s flamboyant colourful styling. His intention is to recreate the lifestyle appeal of Capri and the Cote d’Azur.